The main artery that supplies blood to the arm and hand is called the brachial artery. Its superficial position makes it vulnerable to damage and injury. For example, a person who accidentally breaks his humerus may also experience trauma in his brachial artery. These arteries are located in the shoulders and upper extremities of the body. They find ways to deliver proper amounts of blood to the arm and the hand. The structures and compositions of brachial arteries differ from one person to another. However, as a general rule, this artery runs from the shoulder and straight to the elbow. It originates from the axillary artery, which is located on the lateral border of the body’s first rib. 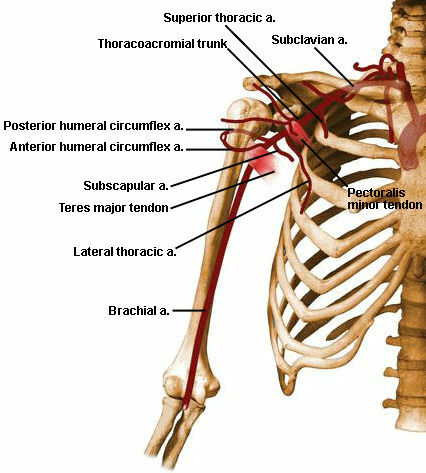 The brachial artery is located at the lower border of the teres major muscle, which is found just beneath the axillary artery. As it hits the elbow’s antecubital fossa, it starts to bifurcate into the radial and ulnar arteries. In most people, this birfurcation appears below or above their elbows. The brachial artery works by supplying freshly-oxygenated blood to the cells located in the shoulders and upper extremities. These cells use up the oxygen and different nutrients from the blood. After this, the corresponding veins carry the blood that was depleted of oxygen and bring it back to the heart. The heart pumps it towards the lungs in order to give it fresh payloads of oxygen. Different health issues and physical conditions can impair the circulation of the blood from the brachial artery to the heart. These include occlusions or damages in the brachial artery, blood clotting disorders and the continuous weakening of the blood vessel’s walls. The brachial artery has six main branches – the superior ulnar collateral artery, the inferior ulnar collateral artery, the radial artery, the ulnar artery, the profunda brachii artery, and the nutrient branches to the humerus. The profunda brachii artery is also known as the deep brachial artery or the deep artery of the arm. It is a large artery that arises from the back and medial part of the brachial artery. Meanwhile, the small superior ulnar collateral artery is located in the brachial artery right below the middle of the arm. Conversely, the inferior ulnar collateral artery is found about five centimetres above the elbow. The brachial artery, together with these six artery branches, work together to pump adequate levels of oxygenated blood into the shoulders and upper extremities of the human body. What is the brachial pulse? The brachial pulse is usually taken by healthcare providers who need to quickly measure the patient’s pulse to assess his or her condition. They also use the brachial artery to take a patient’s blood pressure measurements. A blood pressure cuff is attached to the patient’s upper arm and a stethoscope is placed exactly on the brachial artery. This method allows healthcare providers to get accurate blood pressure readings. However, since the anatomy of the brachial artery slightly varies from one person to another, it can sometimes be challenging to find in some patients.